In a new feature for the handspinner.co.uk newsletter, I will be doing my best to help slightly fictional spinners / knitters in distress. In the postbag this month is a letter from a spinner unsettled by her hubby's behaviour. My marriage seems to have gone a bit cold. He doesn't pay me compliments any more, he looks right past me at the dinner table and he doesn't change his pants as often as he used to. Has he got cold feet? A: Oh dear. At least he's not having an affair, his personal hygiene would certainly be better. Try knitting him a pair of socks to keep his feet warm. Every time he puts them on, and feels their hand-knitted toasty warmth, and how lovely the fibre feels against his feet, he'll think of the hours that you put in knitting them especially for him. To invest more of yourself in them, spin the sock yarn yourself. 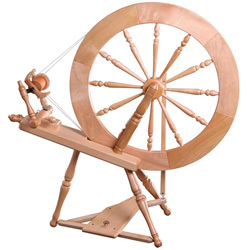 Failing that, your wheel is a good friend and losing yourself in hours of spinning will provide unconditional comfort. Egg-citing sit and spin in North Norfolk?